Church leaders and those who endeavor to plant new churches in Europe today face tremendous challenges, not least because the church itself is considered by many to be outdated, irrelevant, or even an abusive sect. Drawing on a wealth of experience, Church Planting in Europe helps to answer the question of how churches can become more relevant to the societies in which they exist. From biblical and missiological reflections to case studies and practical examples, the book gives insights into many of the key issues that church planters and those concerned with “”missionary”” renewal of existing churches are grappling with. Special attention is paid to the sociocultural and religious characteristics of Europe, which is marked by secularization, new forms of spirituality, and a unique Christian heritage, asking, what are typical barriers and bridges for the communication of the gospel? The contributors represent a wide variety of backgrounds and contexts across Europe and this is reflected in the breadth of topics covered. The chapters were presented during the Mission in Europe Symposium in Belgium (July 2014), and the highlights of the discussions afterwards are also included. The result is a valuable resource for church leaders, mission practitioners, and theologians alike. 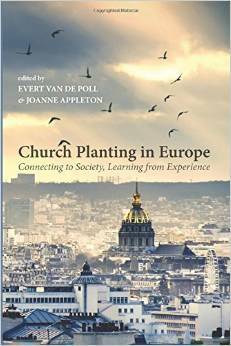 “Evert Van de Poll and Joanne Appleton’s Church Planting in Europe is a timely book on a neglected subject. We find reflections on the biblical foundations, the European context, the church planters, and some case studies. It is recommended reading for theoreticians and practitioners.” —Hannes Wiher, Assistant Professor of Missiology at the Faculte libre de theologie evangelique de Vaux-sur-Seine (Paris), and at the Faculte Jean Calvin at Aix-en-Provence (France). Evert Van de Poll lives in France, where he is pastor with the French Baptist Federation and involved in church development. He is professor of religious science and missiology at the Evangelical Theological Faculty in Leuven, and a mission consultant teaching in various countries. Joanne Appleton is a writer and researcher interested in mission and church planting in Europe, and coeditor of Vista.